This morning I was sent some news about our company which apparently was extremely sensitive. 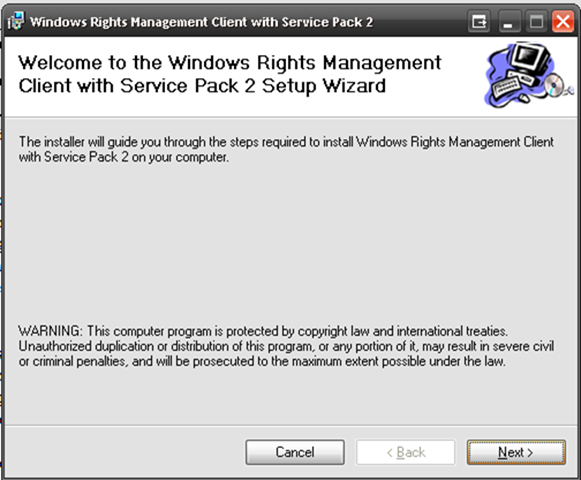 As I was reviewing the document I was given the option of installing the Windows Rights Management software. Curious about where this was going I clicked next and completed the installation. Apparently what I just agreed to was the Information Rights management of Office 2003. This apparently allows granular control of Office related files and emails. 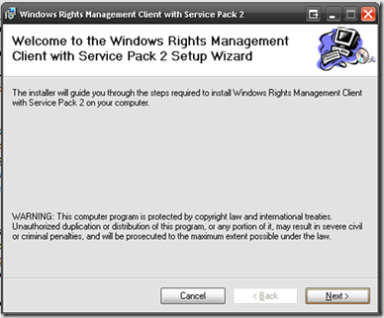 IRM in Office 2003 relies upon Windows Rights Management Services to provide core functionality. Nonetheless, IRM is fully integrated into Office 2003 applications, and it is a simple and natural extension of the content creation and collaboration process with which users are already familiar. Consumption – The recipient opens the document or file as usual. Behind the scenes the application communicates with the RMS server to determine if the recipient has been given rights to access the file. RMS validates the user and issues a use license. The application renders the file and enforces the rights. IRM can be used in Microsoft Office Outlook® 2003 to prevent e-mail forwarding, copying, editing or printing. Protected messages are automatically encrypted during transit, and when rights are assigned to the message by the sender, Outlook 2003 disables the restricted commands. Office 2003 documents attached to protected messages are automatically protected as well. The document in question was detailing information on future mergers and acquisition. My curious nature got the better of me this time ... never again. I actually printed the attached document, and now I wonder if big brother now knows there is a rogue copy in the wild.